Save the date! Please join us on Wednesday, March 14 at 4:00 p.m. in Falvey Memorial Library’s Speakers’ Corner for our Diversity and Inclusion Resource Guide Launch and Reception. 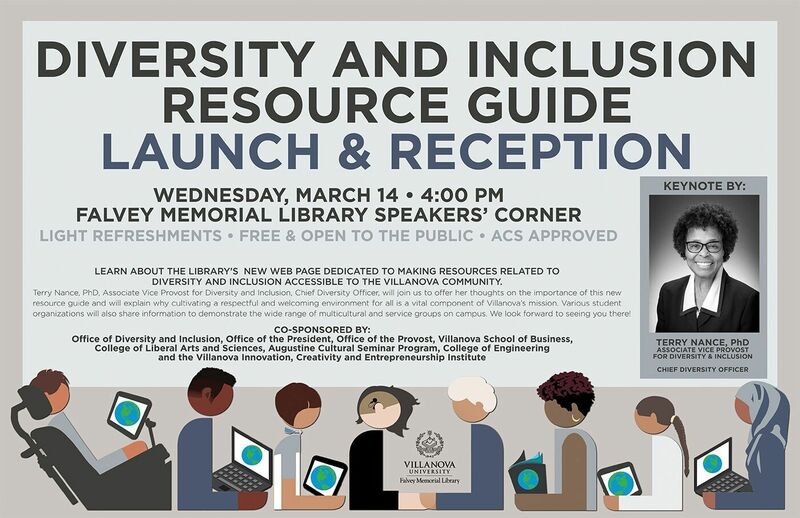 At this event, you’ll learn about Falvey’s new web page dedicated to making resources related to diversity and inclusion accessible to the Villanova community. Terry Nance, PhD, Associate Vice Provost for Diversity and Inclusion, Chief Diversity Officer, will join us to offer her thoughts on the importance of this new resource guide and will explain why cultivating a respectful and welcoming environment for all is a vital component of Villanova’s mission. Later, you will hear from various student organizations, who will share information about their groups.